The Built Field covers the recurring patterns and design solutions relevant to retrofitting detached houses and the other physical systems that support suburban households. This is an obvious starting point for many who want to make their place a better longterm prospect. 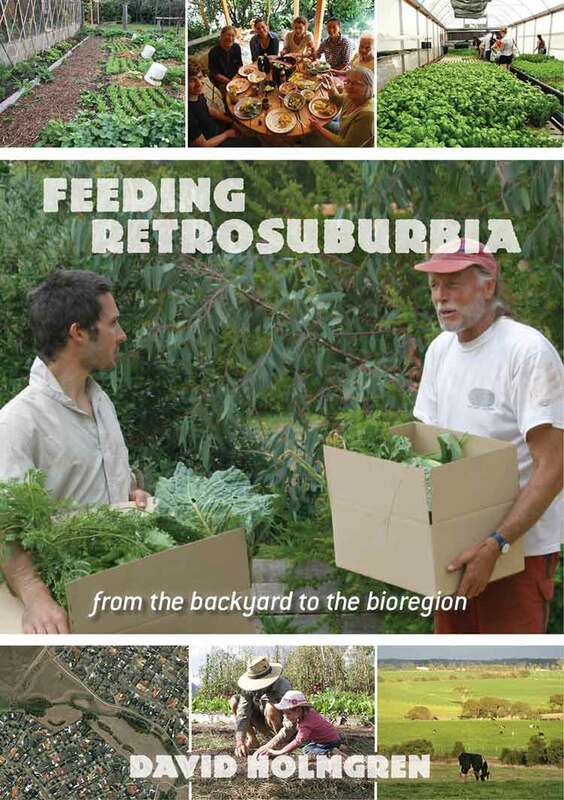 Retrofitting is less costly than new construction, allowing permaculture downshifters to focus on food production, water systems, home-based livelihoods and community resilience rather than sinking all their efforts into state of the art eco-housing. The first chapter, How to assess a property, aims to help you evaluate an exiting property, whether it is the one you are already living in or one you are considering moving to. It is arranged as a series of questions to guide you through the assessment process, and a simplified checklist of these items is available to help you assess all these factors and patterns. Warm in winter, cool in summer tackles the issue of thermal comfort with ideas for keeping the people in your household cosy. This leads naturally into Wood energy with options not only for heating indoor spaces, but also for cooking and hot water. Electricity is a touchy topic with many in society regarding it as an essential service rather than a high quality energy source that should be used for specific functions. In this chapter I explore this idea and provide some thoughts on household electricity generation, as well as some substitutions to allow households to reduce their consumption. The ability to undertake Water harvesting and storage is critical to household resilience, but I also cover the pros and cons of using mains water. 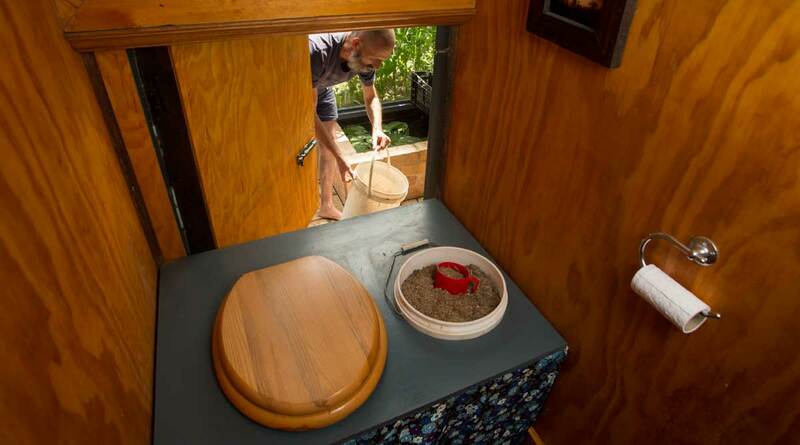 In the garden, this can be supplemented with household wastewater, with human waste supplying further nutrients through composting toilets: these topics are covered in Greywater and human nutrient recycling. A self-reliant household eating a local diet with a lot of home grown produce will need good Facilities for food: storage, preparation and cooking spaces. Retrofitting for bushfire defence looks at the practical, physical things we can do to our buildings and surrounds to make them more resilient to bushfire threats, whilst Storage of stuff tackles the issue of prioritising, organising and storing all the equipment, tools and other objects we might need for a self-reliant household. Retrofitting for shared living discusses infrastructure and changes to physical spaces that could assist you to increase household size and density whilst still maintaining privacy. The Built Field covers many general patterns that might be useful for your living space, but it does not provide specific details. 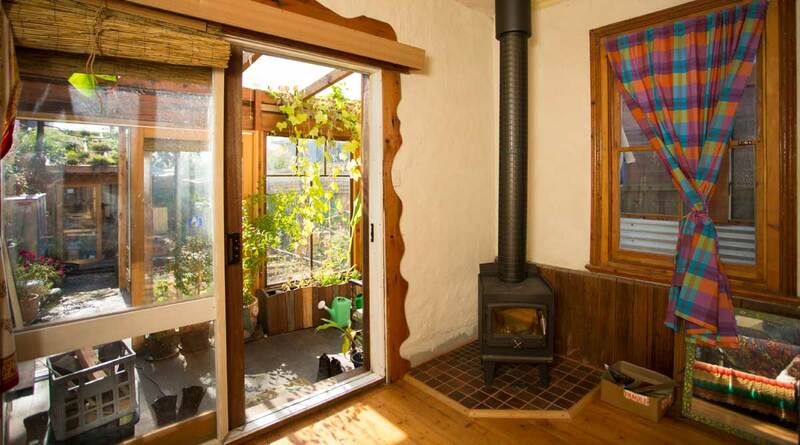 For example, I don’t tell you how to install a safe and legal flue pipe for a wood stove however the patterns I outline should help you review and decide on the best options for wood heat and/or cooking to make your place more comfortable, affordable, productive and resilient in the future. · Energy descent will happen too soon and too fast for significant new construction. · The shift to larger extended family and shared households will reduce need for new housing stock. · The likely collapse of property values will dramatically reduce finance for new construction and major retrofits. · Retrofitting of unneeded commercial building stock will keep up with new housing needs even assuming immigration and population growth continue. This chapter provides you with an overview of the largely non-living patterns of land, energy, buildings and infrastructure. It includes infrastructure controlled by corporations and regulations set by government that we have minimal ability to ‘retrofit’ but can minimise dependence on, work around or struggle to change. These may be human-controlled energies but for the householder they are as powerful as the sun, wind and rain in setting the context for our actions. Consider the patterns in this chapter together with those in Chapter 14, How to assess a garden, that frames the Biological Field, and in Chapter 24, Ownership and living arrangements, which frames the Behavioural Field. You can use the analysis in this chapter to select properties for purchase, or identify strengths and weaknesses in an existing property prior to a retrofit design. Some patterns will apply with modification to co-joined row housing in older inner city suburbs and newer suburbs where larger houses cover most of the lot. If you are an early adopter of retrosuburban downshifting you can benefit greatly from advantages conferred by location, property configuration or features that the market is yet to value. We look at these patterns more or less in order from those characteristic of an neighbourhood or location through to the detailed physical retrofits that may contribute directly to self-reliance and resilience in energy descent futures. How much sun does it get? How is the street arranged? How vulnerable is it to natural disasters? What am I allowed to do there? How much are the rates? Is the building easy to retrofit? What’s on the site and how’s it arranged? What resilience assets does it have? 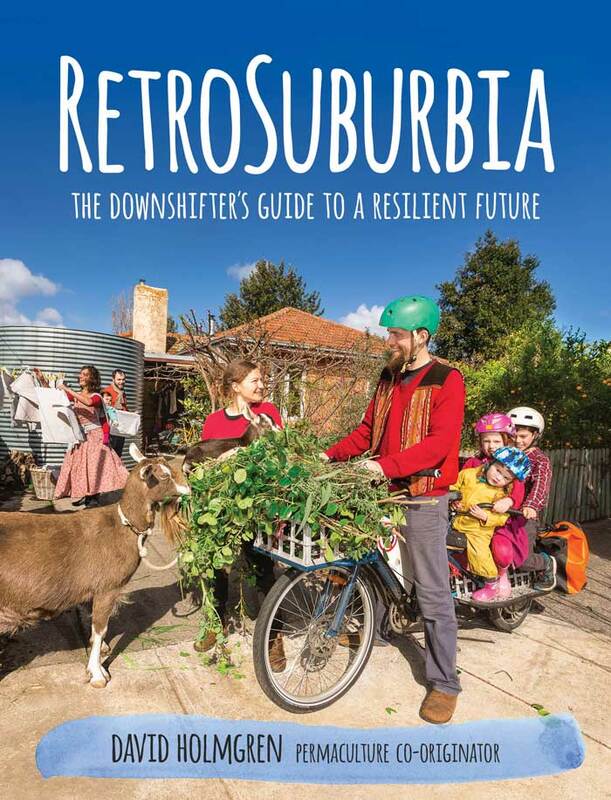 Derek Wrigley’s Making your home sustainable: a guide to retrofitting (Revised ed 2005) gives a very comprehensive overview of Built Field retrofitting options including descriptions and further diagrams on many of the patterns outlined in RetroSuburbia – and more. 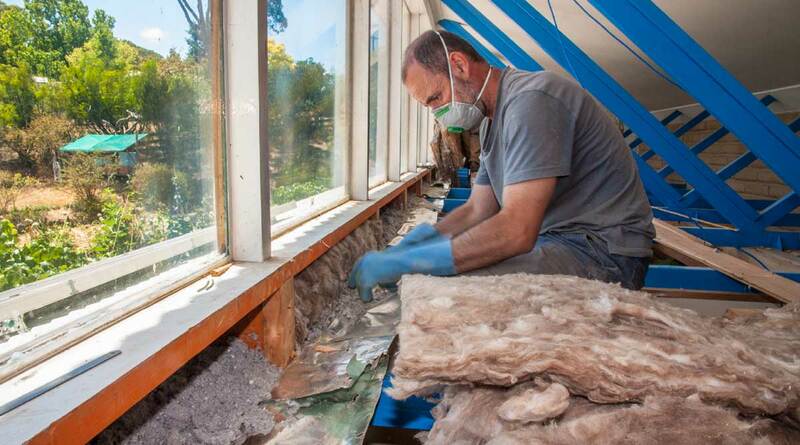 The government website ‘Your Home’ has extensive material on buying and renovating (as well as new builds) with a focus on energy efficiency and sustainability, albeit from a mainstream perspective. Good overviews of different building materials and systems with extensive references and (unusually) the names of the authors of the articles. You can read online, download pdfs or order a hardcopy. Michael Mobbs’ Sustainable House 2 nd Ed (2010) is one of the best documented inner city retrofits focused on sustainability and autonomy, especially good on power, water and waste even if the options have expanded since this book was written. Rosemary Morrow’s A Good Home Forever: Downsizing for the future (ebook) gives an overview of her retrofit of a brick veneer home. Available here. suncalc.net is an interactive website showing you sun angles at different times of the day and the year wherever you are in the world. 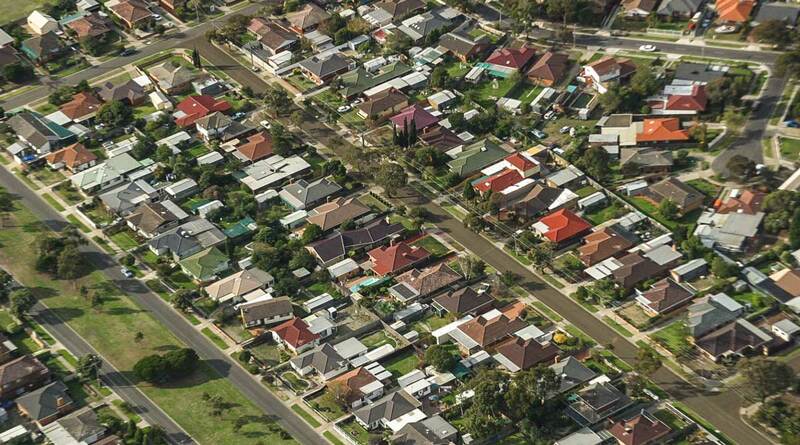 State land data websites such as land.vic.gov.au (Victoria) and SIX Maps (NSW) are useful for gathering data on properties including zoning, overlays and neighbourhood topography. These links are taken directly from the footnotes in the book – we have put them here for easy access when reading the book. It is best if they are viewed in the context of the chapter. While thermally efficient housing may be a critical energy descent issue in North America and Europe, it is not so critical for fit, healthy people living an outdoors focused lifestyle in the mild climates of southern Australia. Strategies for thermal comfort come from both the Built Field and Behavioural Field, but they are covered in this chapter for convenience. Keeping the permaculture principle of Use slow and small solutions in mind while developing strategies for thermal comfort is important. Going with a fancy solution ­– for instance a new, efficient heater – can be tempting; however this may not be the most appropriate solution in terms of money or resources. Often, some integrated smaller solutions can work just as well. Nick Hollo’s Warm house, cool house: inspirational designs for low-energy housing (2 nd ed 2011) covers a wide range of options, including many focused on retrofitting existing buildings. ‘Heating and Cooling’ at Your Home give a useful overview of options but with an emphasis on appliances rather than behavior change. Using wood to heat the house, heat water and cook is one of the easiest, low cost ways to increase energy self-reliance. It is a strong expression of the principle Use and value renewable resources and services. 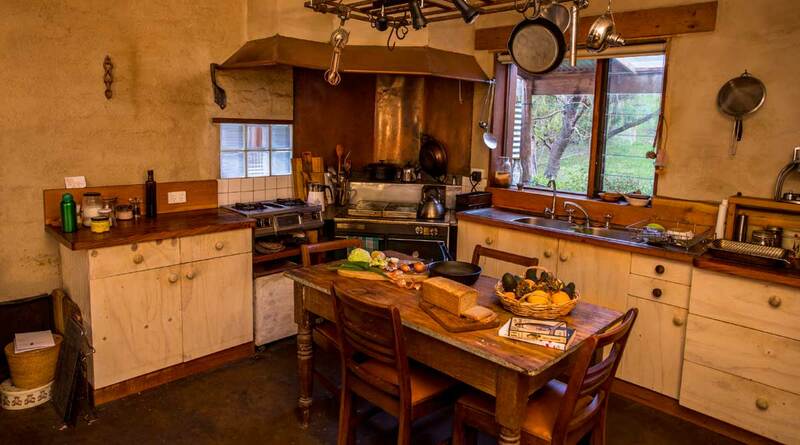 Heating water for drinks, rising dough, growing sprouts and seedlings, and drying clothes are all side benefits of a fire going for heating the living space. Slow cooked food on the heater or in the coals expands the culinary options. Wood heat connects us to our ancestors, uses woody waste and bypasses corporate controlled and government regulated sources of reticulated energy. 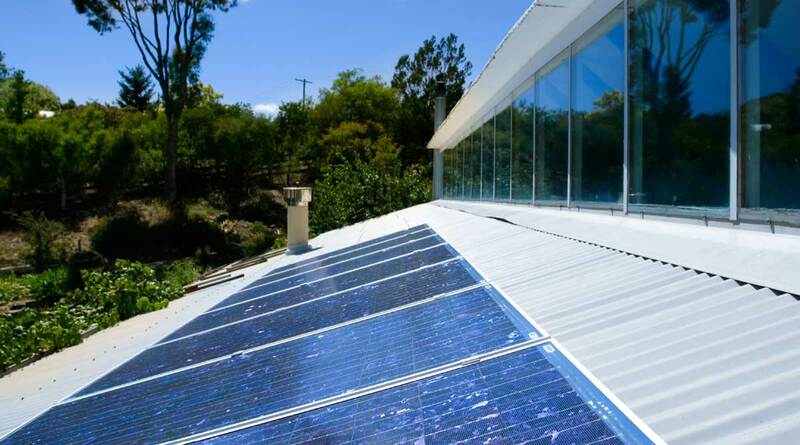 The technology can be manufactured in a basic metal engineering workshop, or even on-site at home from natural and waste materials, and the more technically sophisticated appliances available should allow its widespread adoption in Australian cities. Ianto Evans & Leslie Jackson’s Rocket Mass Heaters (3 rd ed 2015) is the original book from the pioneers of low tech, high efficiency wood heating technology, a classic DIY guide. 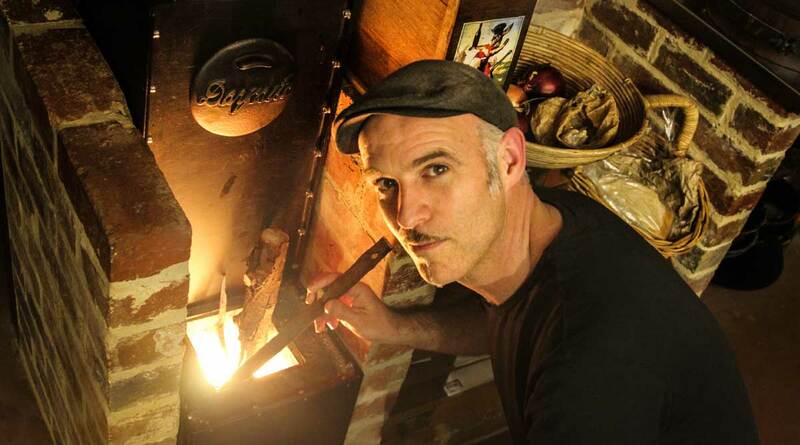 See also their website for an overview and history of rocket stove technology. Pivot Stove and Heating specialise in wood stoves and hydronics. As well as being one of the few specialist suppliers of wood stoves, they produce a good range of videos for the capable DIY person. Electricity is a very high quality form of energy that powers communications equipment, lighting, power tools and motors better than any other option, with zero pollution at the point of use. Where it is cheap and reliable, it can be easily degraded back to thermal energy to cook, heat water and space, and use in many other industrial processes. On the other hand electricity is energy expensive to create, complex to regulate and costly to store. Because most renewable energy sources can create electricity more easily than they can be used to replace liquid or gas transport fuels, most renewable energy optimists see a bright, all-electric future. Reducing greenhouse gas emissions may be driving the shift to electricity powered by renewables, but few householders realise their food supply is a bigger source of greenhouse gas emissions than their household electricity use. The CSIRO Home Energy Saving Handbook: how to save energy, save money and reduce your carbon footprint (by John Wright, Peter Osman & Peta Ashworth, 2009) is a comprehensive but easy-to-read overview of not just options for household electricity but reducing household energy use in general. Water is even more essential to daily life than food, but most Australians take drinkable tap water for granted. Reticulated mains water that is notionally healthy to drink, available at pressure, in almost unlimited quantity 24/7/365 for a cost of $1–2 per kL is one of the services that defines Australia as a first world country. But the complex infrastructure and supply chains that maintain mains water will become increasingly vulnerable to interruption from a range of energy descent factors. Fortunately, harvesting and storage of water adequate for drinking purposes in low-density residential housing involves relatively simple and readily available technology that most people can install themselves. Essential drinkable and potable water is a small fraction of total household water needs, but we can embrace opportunities to reduce demand simply by changing our behaviour: using compost toilets and reusing most household water for irrigation. 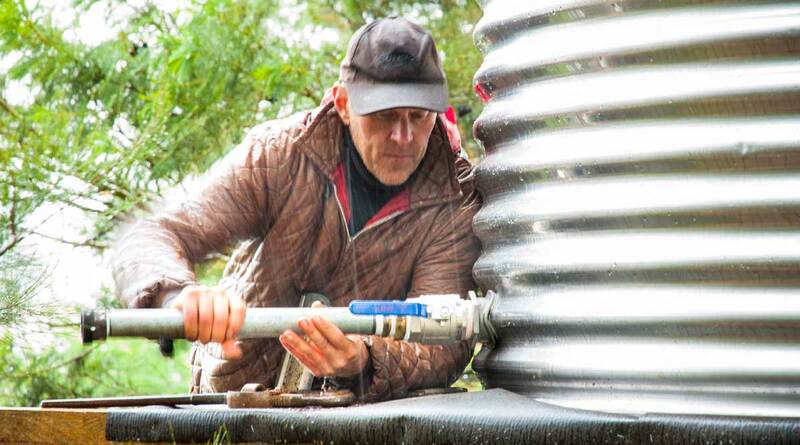 The highly recommended ‘Tankulator’ is the Alternative Technology Association’s online tool for rainwater capture, storage and use. Model different tank sizes, different seasonal scenarios and usage patterns to help determine the optimum tank size and set up for your system. It also has very useful articles on other considerations such as tank materials, pumps and filtration. SmartGardenWatering.org.au is a particularly useful website for modelling the amount of water you will need for your garden at different times of the year – it takes into account different types of mulch, soil and plants and can also take tank water availability into account. Unfortunately only available for Victorian locations at present (you are encouraged to send a feedback form to show your interest in using it in other areas). Brad Lancaster’s Rainwater Harvesting for Drylands and Beyond (2008/2013 Vol 1 & 2) are a comprehensive overview of all things rainwater, with a particular focus on earthworks (including small scale such as redirecting water from street curbs as featured in RetroSuburbia). Art Ludwig’s Water Storage: tanks, cisterns, aquifers and ponds for domestic supply, fire, and emergency use (2009) is a very practical guide to water storage options including designs for ferrocement water tanks. Mobbs (2010) and Wrigley (2005) – see Chapter 4 resources – both have good sections on water harvesting. Mobbs is particularly relevant to those in higher summer rainfall areas. Nick Romanowski has written extensively on aquaculture from small ponds to commercial-scale setups from an Australian perspective. All his books are packed with useful information and are easy to read. For smaller scale urban systems try: Sustainable Freshwater Aquaculture: The complete guide from backyard to investor (2006) and Edible Water Gardens: Growing water-plants for food and profit (2007). Centralised sewerage reduced the noxious odours and diseases associated with early industrial cities and, in more recent times, practices such as the separation of major sources of chemical contamination and increasingly sophisticated biological treatment have reduced pollution. However this has not solved the more fundamental sustainability problems that could make reticulated sewerage an ‘Achilles heel’ for urban settlements in the energy descent future. Using clean water to dilute and transport human waste through an expanding network of pipes is a very expensive way to waste valuable resources. At the beginning of the last century, leading American agricultural scientist FH King travelled to China, Japan and Korea to study why East Asian civilisation was the only one not to have destroyed its agricultural soil and collapsed. His book Farmers of Forty Centuries (1911) documented the composting of human waste and its return to the soil to produce the food that fed the population. That book influenced generations of organic (and permaculture) pioneers, including Joseph Jenkins, author of the Humanure Handbook (2005), the practical guide to valuing and using human waste to maintain soil fertility for growing food. While mainstream sustainability in Australia has increased awareness about the need to reduce the waste of clean water through excess toilet flushing and washing, most people are unaware of the more fundamental long-term problem of critical nutrient loss through this disposal process. The food supply chain is currently sustained by depleting phosphate rock reserves and energy intensive nitrogen fertilisers; the full recycling of human waste to food-producing land is the only sustainable option in a resource and energy constrained future. 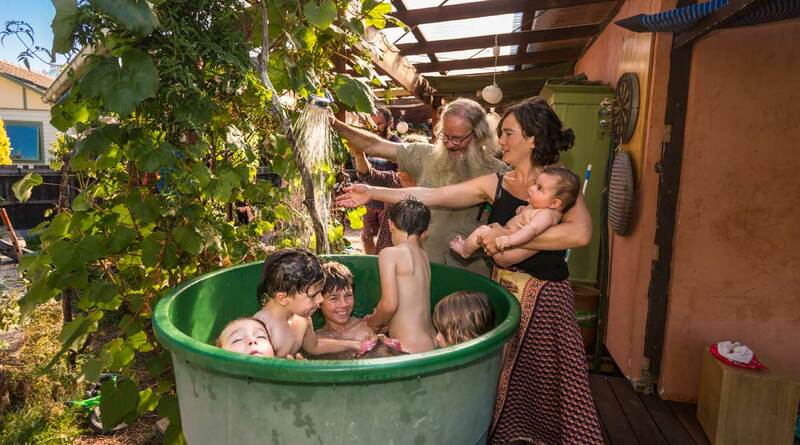 Oasis Designs is the website of Art Ludwig, Californian water harvesting and greywater reuse innovator and author. Extensive information including excerpts from his excellent book Create an Oasis with Greywater. The 3 rd edition of Joseph Jenkins’ classic text The Humanure Handbook is available for download at a small charge from his website. ‘Josh’s House’ Greywater System Factsheet pdf download provides information about nationally approved and professionally installed household greywater systems used in Josh Byrne’s sustainable house in Fremantle. Ecoburbia hosts tours and can organise workshops in waste water retrofitting infrastructure in Fremantle, WA. Kelly Coyne &amp; Eric Knutzen’s Making it: Radical home ec for a post consumer world (2010) is a wealth of useful practical information for the urban retrofitter including suggestions for homemade, greywater-friendly kitchen and laundry cleaners, soaps, and skin, tooth and hair care products. This subject crosses the Built, Biological and Behavioural fields even more than most. Household food preferences and harvesting habits feed the processing and preserving activities of the kitchen, which is the heart and soul of any self-reliant household. I have included it in the Built Field to emphasise the infrastructure and workflow aspects of the subject. You can access many excellent books and other resources on food processing and preparation from a self-reliance perspective so, as with my coverage of gardening, my aim here is to provide an overview of key retrofit patterns. The Melliodora cool cupboard design is outlined and explained in the Melliodora (2 nd ed 2005 ebook) in the ‘House update’ section. Available here. Michael Mobbs’ Sustainable House Chapter 10 ‘The Refrigerator’ has useful information on integrated kitchen design to minimise electricity use in keeping food cold using a range of strategies from appropriate placement of refrigerators through to alternative options such as cool cupboards or Coolgardie safes. See also Chapter 3 for an overview of their kitchen design. In Chapter 4, How to assess a property, I discussed avoiding sites more prone to natural disasters. This chapter is focused on what can be done to retrofit buildings to reduce vulnerabilities to natural disasters. Chapter 33, Household disaster planning, then addresses the most important behavioural changes that increase resilience to disasters. This chapter is almost solely focused on retrofitting for bushfire resilience because: · bushfire is by far the most prevalent and severe natural disaster threat in southern Australia and is predicted to increase with climate change · in energy descent futures, centralised responses to bushfire are likely to become less reliable, more dysfunctional and even draconian over time · as explained in Chapter 4, How to assess a property, there is a growing and under acknowledged bushfire threat to suburban residential areas · retrofitting in the Built and Biological fields can make a substantial difference in the security of a house and property to bushfire · retrofitting to protect against windstorm is really a subset of retrofits for bushfire · making houses and gardens more fire safe is mostly a natural consequence of, or complementary to, other aspects of retrofitting the Built, Biological and Behavioural fields · retrofitting options to protect against flood and stormwater are limited. Joan Webster’s The Complete Bushfire Safety Book 3 rd ed (2000) is a comprehensive guide to making your house and property more fire resistant, creating a fire plan and psychologically preparing for fire – all backed up by experience and research. Her Essential Bushfire Safety Tips (2012) covers the basics of this information in a much shorter dotpoint form. David Holmgren’s The Flywire House: a case study in design against bushfire (1993/2010) gives plans for a suitable house for bushfire prone areas. Also gives an outline of fire behaviour and building vulnerability to fires. Available in hardcopy or as an ebook here. Australian houses have always been large by world standards, but we currently have the dubious distinction of building the largest houses in the world. The rising cost of land drives banks, builders and real estate agents to promote larger houses to maximise resale value. Human nature, like nature in general, abhors a vacuum, so large houses have been filled with possessions while residents are out working and consuming elsewhere. Corporate advertising and government policies encourage increasing mortgage and credit card debt to keep the wheels the growth economy from falling off. Falling prices for goods manufactured in China give us a false sense of abundance while mostly token efforts at recycling moderate our sense of guilt about trashing the planet. · the need for storage space for bulk food, preserves, firewood, water, tools and materials. Luckily, the current combination of large houses but small households means there is a lot of ‘fat in the system’ that can be more efficiently used. Annie Leonard’s short film The Story of Stuff was made over a decade ago and has been very successful in getting people thinking about consumption patterns – both their own and wider society’s. Her 2011 book of the same name expands on these concepts. We know from history, current trends and the actions of innovators that one of the most effective responses to challenging times will be more people living in larger households and people spending more time at home. Large houses and communications technologies, among other factors, provide historically unprecedented opportunities to create productive and resilient households using existing housing stock, however the design of most houses isn’t suited to these changes. While the best new homes and renovations include environmental savings and improved liveability, very few are focused on more people sharing the space. 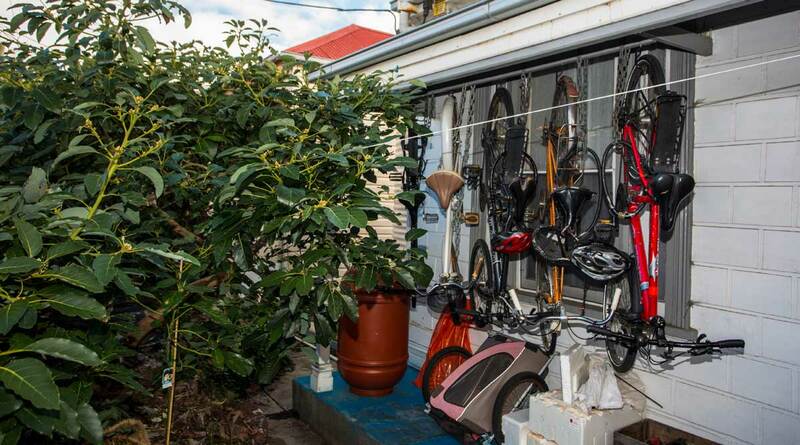 Ecoburbia is a notable exception to this trend – a radical retrofit that both increases resilience and capacity for sharing and home based activities (see Case Study 2: Ecoburbia). The classic text A Pattern Language (by Christopher Alexander, Sara Ishikawa & Murray Silverstein with Max Jacobson, Ingrid Fiksdahl-King and Shlomo Angel, 1977) contains numerous patterns for spaces in (and outside of) houses. Shani & Tim’s ‘Ecoburbia’ in Fremantle, featured in RetroSuburbia and on their website, shows how a house can be divided to create multiple separate but integrated living spaces.